A former homeless man, who is walking from Clitheroe to London, is continuing to highlight the work of Christians Against Poverty. 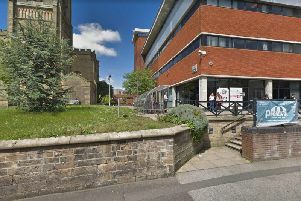 Ashley Parkinson (57) was rock bottom after a business failure and spent three months living in a cemetery toilet block in Clitheroe, struggling to survive the winter. But an invite from someone who had struggled financially took him to a charity coffee morning and the start of a journey which has seen him make a full recovery, find friends and a home. Last week he began a 240-mile walk to highlight the work and raise money for Christians Against Poverty, a charity with debt centres across the UK. According to his Facebook page, Ashley is currently in Altrincham. The walk from Radcliffe took him four hours and 30 minutes. Ashley met a lady called Elizabeth Banks, who walked with him yesterday (Monday) and had him stitches laughing as he walked. He will soon be heading for the Midlands.